each other the advance is, of course, zero; and here we should have the two wave trains in the same phase, with a consequent maximum of light. Where the thickness of the film is such that the second wave train is half a wave behind, there should be a dark band; at one whole wave retardation, a bright band; and so on. The alternations of light and dark bands are thus accounted for, but the experiment shows that the first band is dark instead of bright. This discrepancy is due to the assumption that both reflections took place under like conditions, and that the phase of the two trains of waves would be equally affected by the act of reflection. This assumption is wrong, for the first reflection takes place from the inner surface of the first glass, while the second occurs at the outer surface of the second glass. The first reflection is from a rarer medium—the air; while the second is from a denser medium — the glass. 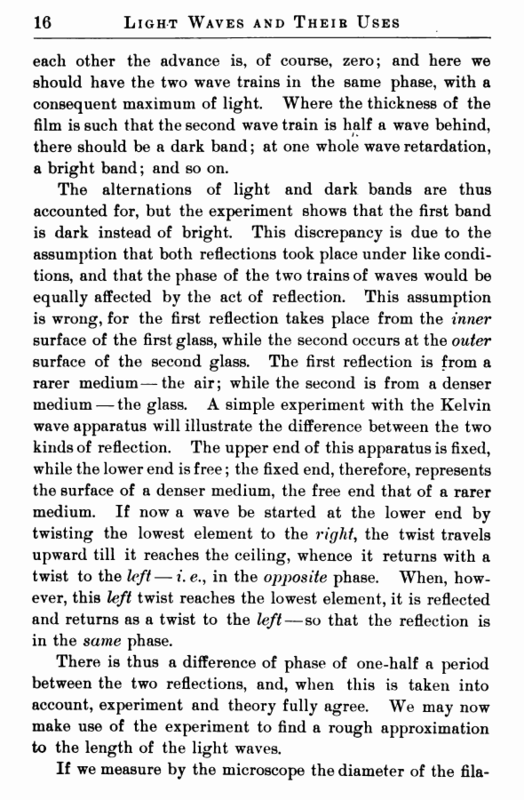 A simple experiment with the Kelvin wave apparatus will illustrate the difference between the two kinds of reflection. 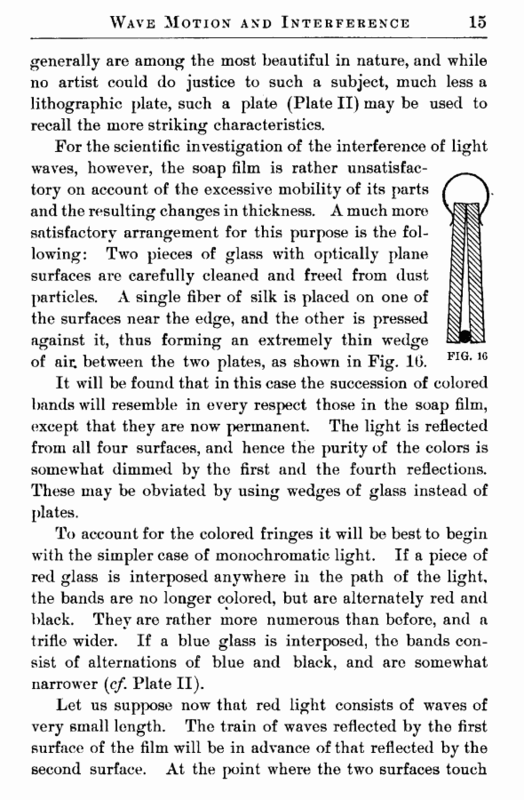 The upper end of this apparatus is fixed, while the lower end is free; the fixed end, therefore, represents the surface of a denser medium, the free end that of a rarer medium. If now a wave be started at the lower end by twisting the lowest element to the right, the twist travels upward till it reaches the ceiling, whence it returns with a twist to the left — i. e., in the opposite phase. When, however, this left twist reaches the lowest element, it is reflected and returns as a twist to the left—so that the reflection is in the same phase. There is thus a difference of phase of one-half a period between the two reflections, and, when this is taken into account, experiment and theory fully agree. We may now make use of the experiment to find a rough approximation to the length of the light waves.